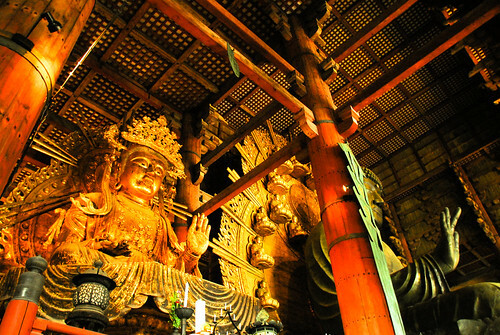 At the Todai-ji temple in Nara, Japan. So after lounging around at the hostel we decided it was time to venture out. We saw that Hep 5 was only a stop away so we decided we would check it out. It's a 9 floor building (plus 2 more basement levels) of shops, video games, food and to top it off a ferris wheel. Sounded like a good activity for the night, and to give you an idea we left around 5 and just got back at 10ish...there is that much stuff! Osaka station was chaotic, and not organized chaos, just chaos. There were so many people and the station is under construction so everyone is going in all different directions. We finally found an exit and took the roundabout way to Hep 5. We started on the first floor and were bombarded with store after store of trendy bordering on ridiculous clothes...and that went on for at least 6 floors. Then there was a break and there was a food level of mid-tier restaurants and then up a little further was the ferris wheel, then an art gallery, and then 2 levels of Sega games (the last of the two were all gambling ones) After getting a feel for it, and being totally overwhelmed we headed to the bottom basement floor and ate dinner in the HUGE food court called Snack Park. Charlton got a Soba dish and I got noodles and sushi. Then it was off to get sale pastries at Don Q before hitting the ferris wheel. Then it was time for us to head back here to the hostel with a quick stop at the grocery store for some drinks. We need to plan how we want to spend our lazy Sunday...more crazy malls? Osaka castle?! Cup of Noodles museum?! So we finished up our stay in Nara, we both loved the city a lot and were sad to leave. Especially the B&B was awesome and we met some really good people. If we were to do it again we would most likely use Nara as our base and head to Kyoto as a day trip (even if we went for 2 days) Oh well, you live and you learn. With our full bellies we headed through Nara Park and to Kasuga Grand Shrine. We skipped the admission fee and just walked around it peeking in. It was a little too crowded for our liking anyway. Then we made our way back through the park, spending time walking passed all the food carts selling all sorts of carnival like food. The highlight was watching everyone feed the deer the deer cookies they had purchased. The girls and kids would squeal, was a riot. Then we made our way back to the main shopping district grabbed a mochi and poked in a few places and then settling for lunch at a grocery store right in the thick of it. Got some seaweed salad, a huge prepared plate with everything from sausage, katsu, duck? and pickles. Such a great value. We then headed to the B&B to pick up our bags and head to the station. 40 minutes later we are here in Osaka, lounging in our room. We are planning on maximizing our weekend here by taking it easy much like we did today. We leave here Monday morning first thing and head for Hiroshima. So we will trying to enjoy the rest while we can. Just got into Osaka and checked into the hostel and did laundry and then took a shower, I lovelovelove being clean and having clean clothes! One of the more famous Japanese scenes. 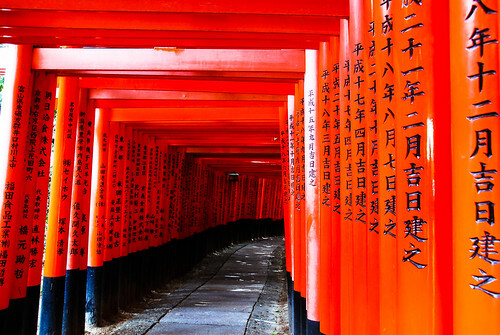 This shot was taken at the temple Fushimi-Inari which is basically a temple dedicated to business. Each one of the toris is sponsored by a company looking for good fortune. Hence there are thousands of them. Just finished up a relaxing breakfast at our B&B here in Nara. The owner provided us with some lovely fruit and some assorted cakes. yum! We have a few more things to throw in our bags before we head out to see the rest of Nara (and maybe do some shopping, yay!) and then its off to Osaka.